Ric’ O’Barry has fought tirelessly for dolphins. “Behind the Dolphin Smile” documents Ric’s work as an advocate for dolphins worldwide opposing captivity, slaughter, and helping captive dolphins return to freedom.
. This updated edition also includes a preface on drive fisheries, what is happening to end the slaughter and capture of dolphins in Taiji, and his academy award-winning film, “The Cove“. 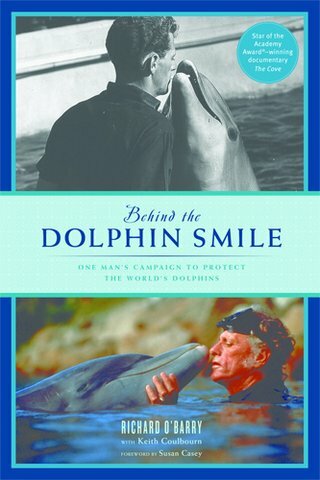 “Behind the Dolphin Smile” is a must have for dolphin activists and dolphin lovers. The book is both inspiring and educational. As always Ric O’Barry reminds us not to be fooled by the dolphin smile. This entry was posted in Cetaceans, Dolphins, The Daily Scoop and tagged Dolphin, Flipper, Japan, Miami Seaquarium, Ric O'Barry, taiji by Kirsten Massebeau. Bookmark the permalink. This is a french petition so that the french media talk about the cetaceans massacre in Taiji, in order to inform as many french speaking people as possible on these unhuman practices. Thank you by advance to sign it and share it to as many people as possible. Because France also needs to be informed ….